Welcome to Pals and Company. Manufacturer & Exporter of Industrial Engineering Equipments. We are an ISO 9001:2008 certified company, established in 1989, at Gurgaon. We are a Member of Gurgaon Industrial Association. Customized solutions and industry leading prices help us to serve Clientele like Atul Limited and Star Paper Mills Limited. Our product range consists of Coal Crushers, industrial equipments and coal granulators. 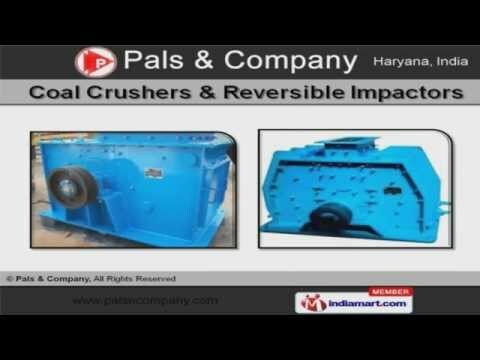 We are one of the large manufacturer and exporter of Coal Crushers and Reversible Impactors. We offer Reversible Hammer Mills and Vibrating Screens that are well known for their durability. Backed by profound experience of the industry, we have been able to offer the clients high grade Industrial Equipments. Along with that we offer Non Reversible Hammer Mills that are a class apart. We are engaged in offering Coal Granulators that are appreciated by the customers for their functional efficiency.